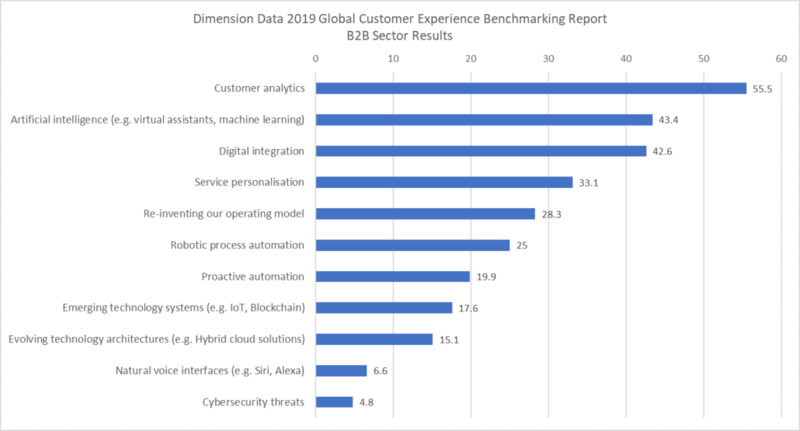 CX expert Peter Lavers deep-dives Dimension Data’s 2019 Global Customer Experience Benchmarking Report to explore three key subjects that are vital for every B2B company to take a long, hard look at itself about. 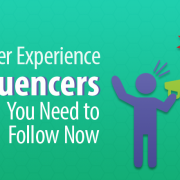 Dimension Data recently released their latest Customer Experience report, and as a recognised CX influencer they gave me a sneak preview of the findings and the opportunity to meet and discuss the big issues with the researchers and authors of the report. 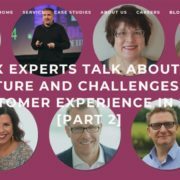 The report is a fantastic free resource, addressing questions that are 100% pertinent to the issues faced today by Chief Customer Officers and CX leaders. The full report is 145 pages, and there’s an excellent Executive Summary that you can download, so I’m not going to just repeat it here. Dimension Data kindly gave me direct access to the data so I could slice and dice the results by sector and region. I immediately dug into the results in the business-to-business (B2B) sector, and the following three subjects from just the first section leapt out to me as vital for every B2B company to take a long, hard look at itself about. 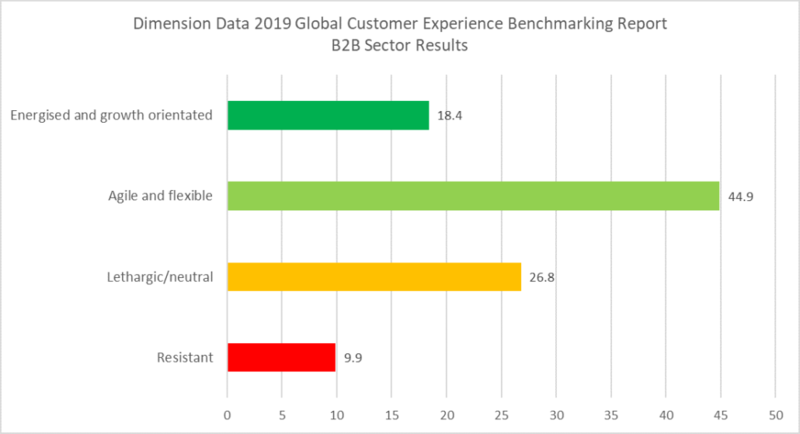 The data below is © Dimension Data, 2019 Global Customer Experience Benchmarking Report, but the observations and conclusions are my own. Please see the full report for Dimension Data’s own excellent commentary on the results for these questions at a global cross-sector level. How well are your strategy and operating model aligned to delivering and optimising CX? This question gets to the heart of customer centricity. The colour coding is my own, and we see that in B2B over 50% of companies haven’t yet joined up silos in the organisation. I passionately believe that customer experience needs to be seen and managed systemically, and these businesses are hamstrung! Customer are increasingly ‘omnichannel’ in behaviour, and we’ve got to be joined-up in response. Systems Thinking helps immensely in addressing siloed organisational design, mentality and behaviour. If you want to see an example of a systemic B2B customer management model then I’d recommend taking a look at the Customer Attuned Business Capability Builder. 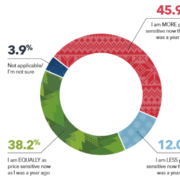 What are the top things most likely to reshape your CX capability during the next five years? The results are striking! Wonder why you hear so much about Data Science, AI, and Digital? It’s because these are the areas in which there are the highest expectations of capability transformation – even in B2B! I am not surprised that analytics takes the top spot, having witnessed the symbiotic effects of storage and processing power being revolutionised concurrently with real-terms cost reduction. 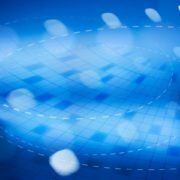 The message is clear – data and analytics are a battle ground that B2B companies need to win in. Don’t get left behind! Artificial Intelligence coming second in B2B is somewhat unexpected, and could be an indicator of recognition that the sector needs to catch up. Great expectations have been placed on “going digital” and we’ve got to be careful not to over-egg this as a silver bullet. The top 3 will aid the 4th on the list (service personalisation) and it’s interesting to note that nearly 30% see the need to re-invent their operating model. To these I’d re-emphasise the point above about taking a systemic approach to doing so! These expectations of transformation lead directly to my third and final subject that’s addressed in the report – ability to change! What best describes your organisation’s approach to change? The realisation of the expectations above into profitable business-as-usual is utterly dependent on how well change is managed. The colour coding is again my own, and it’s hard to believe that one in ten B2B organisations are resistant to change and over a quarter more are ambivalent / indifferent! I mentioned that I’m a recognised CX influencer and ‘futurist’. That’s accidental – all I do is post content that I’m passionate about that has got noticed. It has a huge benefit of being given access to insight and trends across sectors. All I can say is that the findings in Dimension Data’s report thoroughly agree with the body of opinion regarding the opportunities and threats in 2019. Leaders in companies that aren’t embracing change should be considering how they can provoke internal disruption before their business gets disrupted by somebody else. 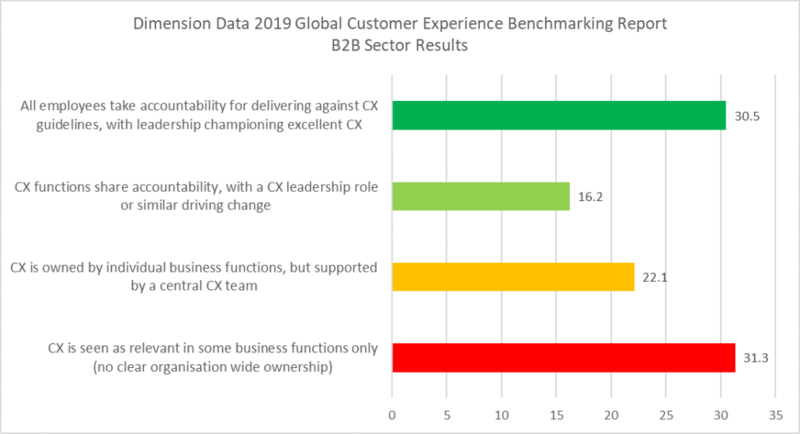 These three examples of the findings in one particular sector illustrate just how useful Dimension Data’s 2019 Global Customer Experience Benchmarking Report is as source information and evidence for CX professionals and in CX strategy development. I highly recommend that you take them up on the offer of a free copy! Please note that this blog has been independently written for no commercial gain.